Home > Outbuildings > Staircases: What Type? What Will Fit? Limited Space? A single flight of stairs with wooden spindles is a common sight in a new home. As the designer of a self build house you have much more choice in how to climb from floor to floor in your new home. A staircase can be a major feature in a new home. From sweeping oak staircases that lead to balconies in grand houses to bespoke spirals rising through three floors in small town houses, the choice can make a difference to the overall effect of the home and become a focal point of the room rather than just a conveyance from floor to floor. Materials used in the construction of any staircase must be able to hold the weight of not only those living in the house but take into consideration items that are carried between floors. If the staircase is tucked away in a dark space a construction of glass and bright steel will brighten up the area. On the other hand if the stairs are to be covered in carpet a basic set of stairs is all that is needed. Study magazines and plan your staircase in the same way you would other interior design aspects. Sometime a staircase has to be squeezed into a small space in the house. It may also be needed for an entrance down to a cellar or up to an attic when making extra room in an existing property. Measure the space carefully before ordering your stairs as it will prove expensive to alter at a later date. Spiral stairs are very popular these days and can be purchased from the Internet and delivered ready to install. Guidelines are simple to follow and can be installed with ease by the self builder. Even the tread on the staircase can differ in style and there are steps that accommodate smaller areas with ‘hit and miss’ treads. The balustrade, handrails and spindles that make up the support to the staircase are also an important feature of the erection. These can copy to style of the treads or be a feature on their own. If you have stained floorboards and other wooden feature in your new home carved newel posts and spindles will add warmth and interest to the stair area. These can be bespoke and ordered from master craftsmen or simply bought from your local building supply superstore and stained or painted to your own design. 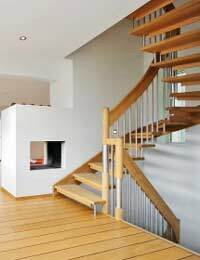 Hard wood, soft wood, glass, steel and even rope can be useful materials that support your staircase in the self build home.